A hot-headed Italian chef attacked his then partner – for the second time – after she started talking to one of her friends at a barbecue at his home, a court heard. Carmelo Trapanese (37) got angry and left Miranda White with a black eye and scratches to her body, after he followed her upstairs, grabbed her by the throat, squeezed her neck and hit her. He was then said to have stopped her from leaving. 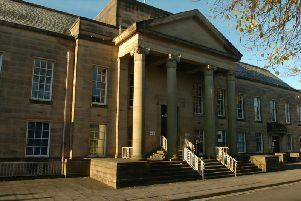 Burnley Crown Court was told Trapanese had been banned from seeing and contacting the victim at the time because of a three-year restraining order. He was also subject to a suspended jail term after he pinned Miss White to the bed and started strangling her in an earlier outburst, which ended with her choking and struggling for breath. Trapanese, who was born in Palermo in Sicily, worked until recently at an Italian restaurant in East Lancashire, but lost his job after police turned up and arrested him for the latest attack. The defendant, of Albert Street, Burnley, is now starting a total of 12 months behind bars. He had admitted breaching a restraining order, had been found guilty after a trial of common assault and had also been convicted of breaching a restraining order and committing a further offence during the operational period of a suspended sentence. Trapanese had been committed for sentence by magistrates. Prosecutor Mr Steven Wild told the crown court that on August 30th Miranda White stopped an officer outside Burnley Police Station to report she had been assaulted earlier that day by Trapanese whilst he was subject to the restraining order. The order had been made in October 2015 and lasts until October 2018. The prosecutor said Miss White told police there had been a barbecue at his address. He continued: “A couple of her friends attended during the night. She had spoken to one of these friends and that appeared to anger Mr Trapanese. "She went upstairs, he followed her and grabbed her by the throat. He was squeezing her neck. She says she was scared and started to try and protect herself by throwing things and scratching at him. Mr Wild said the defendant was found guilty of the assault in December. He added: “Before the case reached court, Miss White indicated to the police she had received a number of text messages and voice calls from Trapanese, in essence telling her not to attend court. But, in any event, she did attend court, clearly gave evidence and he was convicted.” Trapanese had two previous convictions, both relating to Miss White. The hearing was told the defendant had been convicted of assault causing actual bodily harm after attacking the victim in July 2015 and he received eight months in prison, suspended for two years. Philip Holden, in mitigation, said the defendant had been in this country all his adult life.